Ahhh! 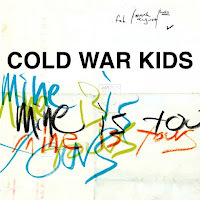 The Cold War Kids have a new album coming out Tuesday! That's the best headline I can give you! Five years ago they released Robbers & Cowards and you might have heard their single "Hair Down" in 2006. Unless you wrote them off for their weird band name. Around that time, Daytrotter's Sean Moeller said they "write and play songs as if they're burning from the inside out." That's Cold War Kids. 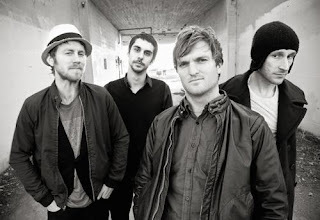 Stories begging to be told are easily unfurled on the lips of Nathan Willett, and the necessary sounds that support these tales come through in the form of bass, piano, rhythm, and drums provided by Matt Maust, Jonnie Russell, and Matt Aviero. 2008's Loyalty to Loyalty was heavily thematic, full of characters with sad and mysterious backgrounds. And although their third album, Mine Is Yours sounds like it is closer to the same vein as the first, the stories are even more powerful. The slow burn starts off with an opening title track, and the souls of these voices penetrate more as each track progresses. Don't get attached to me, "Royal Blue"'s narrator warns. But his counterpart, in Track 4, "Finally Begin", sounds like he figured something out, even if he's still working on it all. 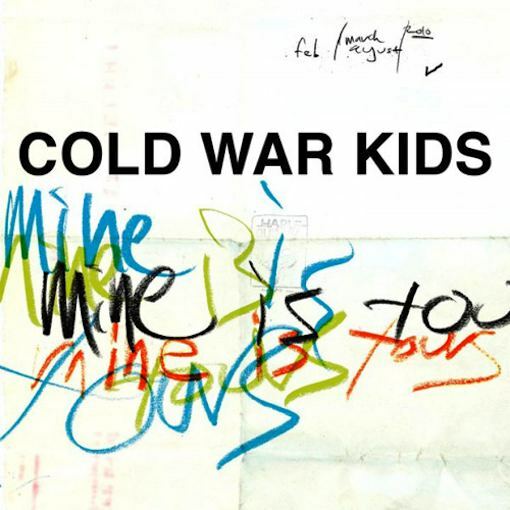 I think I'm sharing that track not because it's the strongest on the album, but because it best demonstrates the typical Cold War Kids theme: "I know what to do, but I can't make the choice and I'm stuck in the middle. So here's my whole story, with half of it left out." This album rocks. I want to share every track with it. Make sure you grab it on Tuesday. I nearly wrote this album up as well. I'm glad you got to it first, because you said it so much better than I could have. Thank you! I really loved this album and can't stop listening to it, but it was still hard to decide what to say!